on-line downloads for all audio CDs coming soon! John Muir, it has been said, died of a broken heart in 1914 after losing his battle to save the Hetch Hetchy Valley in Yosemite National Park. 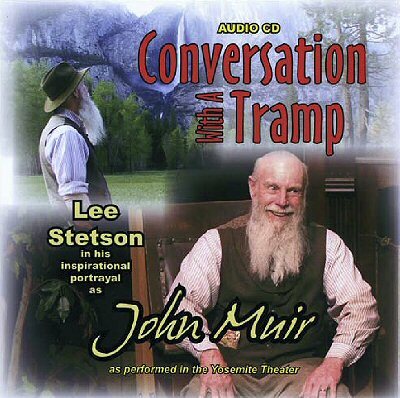 But Muir is alive – and his environmental message continues to thrive – due to the artistry of actor Lee Stetson who has been portraying the famous naturalist in Yosemite and throughout the U.S. since 1983. 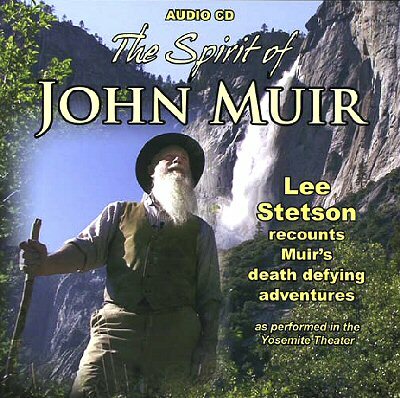 In Lee Stetson – The Voice of John Muir, you’ll not only learn about Stetson’s remarkable career, you’ll also witness how Muir’s eloquent words, written a century ago, continue to influence beliefs and attitudes. You’ll journey with Stetson as he traces Muir’s roots through the Wisconsin farm fields, be inspired by excerpts from his five stage plays, and be captivated by both the majesty of Yosemite and the spirit of John Muir. Muir’s thrilling account of being trapped on a glacier with a wee dog named Stickeen. This one-man stage play starring Lee Stetson, based on the life and works of the naturalist John Muir, has delighted tens of thousands of theatre goers in Yosemite National Park for more than a quarter of a century. Thousands more have been inspired by his performances at wilderness organizations, universities, communities and museums throughout the country and the world. This most popular of his performances takes you to John Muir’s home in Martinez, California, on the evening when Muir is waiting word on the fate of the Hetch Hetchy Valley. 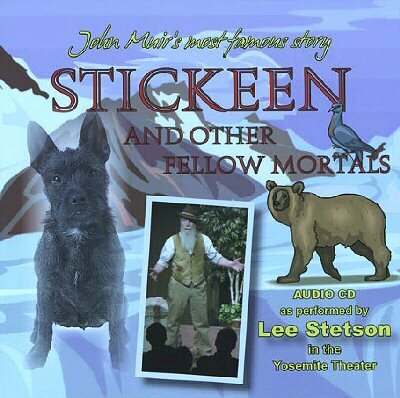 The icy storm story of a little dog named Stickeen is perhaps the most popular and most loved of John Muir’s many wilderness adventures. Your heart will race with excitement and anticipation as you listen to renowned actor Lee Stetson describe the thrilling adventure of this “little, black, short-legged bunchy-bodied, toy dog” on the Alaskan glacier. You’ll also hear Muir’s other thrilling – and true – animal encounters, with bears, rattlesnakes, pigeons and many more, including dogs, cats and sheep. All are extracted from Muir’s writing and woven by Stetson into a splendid performance. Always exciting, often humorous, these stories present Muir’s “gospel” of preaching the fundamental unity and kinship of all the earth’s life forms. This one-man stage play created by renowned actor Lee Stetson presents the true but incredible death defying adventures of the naturalist John Muir. One moment will have you sweeping down a snow avalanche for 3,000 feet, the next climbing up a 500-foot ice cone at the foot of Yosemite Falls, then rocking and reeling on a new-made talus slope during a stupendous earthquake. These true stories include a perilous night on Mount Shasta and Muir’s dangerous ice-sled trip on an Alaskan glacier, among others. Twenty-two of John Muir’s greatest adventures. 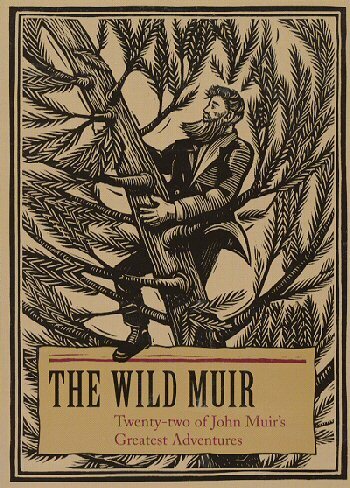 Here, in his own words, is a collection of John Muir’s most thrilling experiences. From his famous snow avalanche trip down a side canyon in Yosemite Valley to his death-defying fall into a frigid stream on an Alaskan glacier, the renowned outdoorsman’s exploits are related in passages that are by turns exhilarating, unnerving, dizzying and outrageous. Lee Stetson has carefully chosen episodes from every stage of Muir’s life, prepared short introductions to place each in context, then arranged them chronologically so that the reader can vicariously enjoy one man’s life of adventure. The text is nicely complemented with striking black and white scratchboard illustrations in the woodblock style by Fiona King.